We’re reaching the end of the food rainbow. But just because we’re on the dark side of the spectrum doesn’t mean we’re lacking nutritional finds. Here are 6 Brown and Black foods to enjoy. Mushrooms – Mushrooms are a good source of copper which is helpful for producing blood cells and heart health. Additional nutrients are vitamins C, D and B; and the minerals selenium, iron, magnesium, phosphorous, potassium and zinc. Button mushrooms also promote heart health, benefit the immune system, and have anti-cancer benefits. Find more information about health benefits of a variety of mushrooms here. Mushrooms work well in soups, stews, salads, casseroles or on the grill. Black Beans – Beans, beans they’re good for your heart… Black beans are full of fiber, molybdenum, folate, protein, and iron. 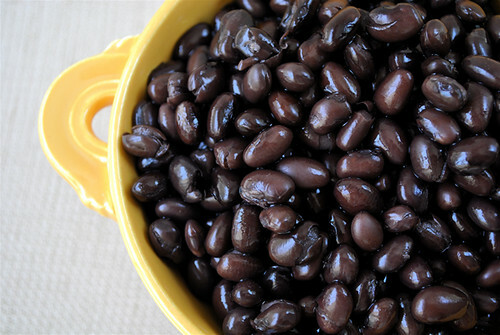 The fiber in black beans can also help regulate blood sugar. Enjoy black beans in salads, soups, quesadillas, and seasoned over rice. Brown Lentils – Lentils are high in fiber, low in fat, and high in protein. They’re also a great source of iron, folate, phosphorus, and potassium. Enjoy brown lentils in stews, soups, and casseroles. Dark Chocolate – The health benefits of chocolate keep turning up. Not only is dark chocolate delicious it is also rich in antioxidants which might help to reduce heart disease and some illnesses. As with all delicious things, eat dark chocolate in moderation about 3 ounces a day. Dark chocolate has a rich flavor which makes it easy to enjoy just one square. Black Tea – Black tea is packed with antioxidants. An article from WebMD says: “The bulk of research shows that regular tea drinkers, people who drink two cups or more a day, have less heart disease and stroke, lower total and LDL (often called “bad”) cholesterol, and that they recover from heart attacks faster.” Drink tea hot or cold, be adventurous and try other varieties and flavors. Next week I’m winding down my series of healthy foods of the rainbow with the color white.